In a recent survey by the Food Standards Agency, it was found that three percent of those who responded were full vegetarians – or vegans – meaning they consume no animal products at all. 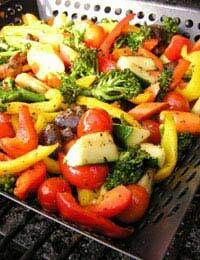 Five percent were partial vegetarians, consuming some animal products. While the number of vegetarians has gone up, they still represent a small portion of the British population. Yet if we look at how vegetarianism affects digestion, we can see that some of these benefits can mean that eating 'vegetarian' once in a while might be beneficial to even the keenest of meat-eaters. Lacto or lacto-ovo vegetarians still enjoy dairy products. With the absence of meat products, they may be more likely to eat probiotic-rich yogurts as part of their regular diet. These introduce 'friendly' bacteria into the gut, aiding in digestion. Although we tend to associate bacteria with ill health, these friendly bacteria play a symbiotic role. While there are still those vegetarians who don't eat enough fruits and vegetables – instead loading up on breads and cheeses, for instance – others benefit from the enzymes in fresh produce. Much of the overcooking that occurs in the modern household destroys or compromises the quality of foods, nutritionally-speaking. Another benefit is that vegetarians can be more likely to obtain sufficient fibre in their diets from all of the fruits, vegetables, nuts and whole grains they consume. Many Britons don't obtain enough fibre in their diets. Simply adding in servings of fruits or vegetables throughout the day with each meal can bring you up to your daily requirement. Depending on where in the world you live, most daily fibre requirements range from approximately twenty grams per day to thirty grams per day. Those vegetarians who eat nuts and seeds as a regular part of their diet benefit from the antioxidant properties of these foods. They also obtain the heart-healthy fats that nuts and seeds provide to the body. While nuts were once hailed as a worrisome food due to their high fat content, we now know that these unsaturated fats provide a whole host of health benefits. New vegetarians can actually complain about stomach upset because they aren't used to eating foods that are high in fibre. Gas, bloating and an upset tummy can be complaints – more so when insufficient water or other fluids are being taken. Other new vegetarians may not have increased their water intake to correspond to the new, higher fibre intake in their diet. Another issue with a vegetarian diet – namely a vegan one – is vitamin B12. This nutrient is found solely in animal products. Older research at one time initially brought forth interest in certain forms of nutrient-rich algae as a possible vegetarian source of B12. We do, however, know today that this B12 is not one that the body absorbs and utilises. Animal sources remain an important source of B12. Fortunately, many vegan products are fortified with this vitamin. Other vegans will likely choose to supplement as well, which helps to ensure they are obtaining adequate B12. Assuming you pay close attention to obtaining enough of this vitamin along with eating a balanced diet, you may find that a vegan diet is beneficial to your digestion. Unhealthy people can be meat-eaters or vegetarians. Being one or the other isn't automatic cause for good health or poor health. At the same time, there are still some important benefits to eating vegetarian if it means incorporating many more fruits, vegetables and nuts into your diet. We can all benefit from eating more nutritious foods so consider 'shadowing' the healthy aspects of a vegetarian diet once in a while.